Russia’s Soyuz-FG is slated to return to flight with the launch of Progress MS-10 cargo resupply mission (designated Progress 71 in NASA’s numbering system) to the International Space Station (ISS) on Friday, November 16. 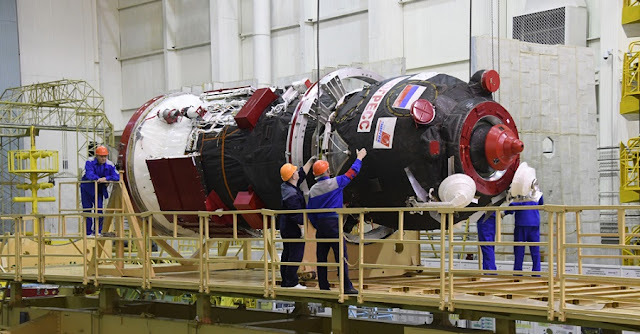 Soyuz-FG’s comeback launch comes slightly more than one month after the booster failed to transport the crew onboard the Soyuz MS-10 spacecraft to the orbital outpost. The October 11 flight ended in launch abort when one of the rocket’s strap-on boosters failed to separate properly. Russian state commission found that a faulty sensor was responsible for the accident. There were worries that the last month’s failure would jeopardize subsequent Soyuz launches, however Russia’s orbital flight schedule suffered only from minor changes. Progress MS-10 mission, initially targeted for February 22, was rescheduled several times before the accident and finally set for October 31. The decision to postpone Progress MS-10 mission due to the Soyuz-FG failed orbital launch was announced on October 30 by Sergei Krikalyov, Roscosmos’s Executive Director for Manned Programs. He revealed that the additional time was needed to conduct thorough examination of the Soyuz-FG launch vehicle and its maintenance. He also added that three unmanned launches Soyuz launches will be performed first. Therefore, since the accident, two Soyuz 2.1b launches has been conducted by the Russian Armed Forces – on October 25 and November 3. Moreover, a Soyuz launcher in the ST-B variant was used by Arianespace to deliver Europe’s Metop-C weather satellite into space on November 6. All the three launches went flawlessly and no problems with any part of the Soyuz booster were identified. Preparations for the Progress MS-10 launch are well underway at Baikonur Cosmodrome in Kazakhstan from which a Soyuz-FG rocket is scheduled to lift off at 18:14 GMT (1:14 p.m. EST) on November 16. The spacecraft passed crucial tests in early November and the technical management at Baikonur decided to give the green light for its filling with propellant components and compressed gases. These operations were completed November 6-7 and the cargo vehicle was then ready for final processing operations. The Progress MS-10 spacecraft was integrated with a ring adapter on November 10. After that, two days later the teams conducted final inspection of the vessel and encapsulated it in a payload fairing. The integrated payload stack was then ready to be installed on the launch vehicle, what took place on November 13. Hence, the completely assembled Soyuz-FG is now ready to rolled out to the launch pad. After liftoff on Friday, the Soyuz-FG rocket is planned to complete a short vertical ascent and conduct a relatively brief flight to orbit lasting some nine minutes. If the the ride to space goes according to the plan, the Progress MS-10 will then start a two-day trek to the Space Station. The spacecraft is scheduled to dock with the Zvezda Service Module of the ISS at 2:29 EST on Sunday, November 18. The automated docking will be monitored by cosmonaut Sergey Prokopyev, who arrived at ISS on June 8, 2018, onboard the Soyuz MS-09 spacecraft. Progress MS-10 is slated to deliver approximately 2.5 metric tons of cargo to ISS. Besides fuel, food, clothing and medical supplies, it also transports personal hygiene items as well as water, and compressed gases. Progress MS, which is manufactured by RKK Energia, is an improved variant of the Progress automated cargo spacecraft that has been used to deliver supplies to the space station. It has a similar size, mass, and cargo capacity as the modified Progress M employed previously in this role. The MS variant features a series of upgrades. The improvements include the addition of an external compartment that enables deployment of small satellites, the addition of a backup system of electrical motors for the docking and sealing mechanism, and additional panels in the cargo compartment that increase protection from micrometeoroids. The new version also has a number of upgrades regarding telemetry and navigation systems as well as a new digital communication system that enables enhanced TV camera views during docking operations. The first Progress MS spacecraft was launched into space on December 21, 2015, by a Soyuz 2.1a rocket. The Soyuz-FG booster, that will be used for Friday’s launch, measures some 162 feet (49.5 meters) in height and weighs an estimated 305 metric tons at liftoff. The rocket is capable of carrying more than seven metric tons to low-Earth orbit (LEO). It is a three-stage launcher that utilizes a core stage, powered by an RD-108A engine, that burns throughout the first and second stage portions of the flight. Stage one is composed of the core stage and four strap-on boosters. These four liquid-fueled strap-on boosters, fitted with an RD-107A engine each, provide extra lift during the initial phase of the flight. Before liftoff, all four of the boosters are ignited to reach full thrust and then are jettisoned once their fuel tanks are empty. Soyuz-FG debuted on May 20, 2001, when it lifted off with the Progress M1-6 cargo craft to ISS. To date, the booster was launched 65 times and only its latest flight was unsuccessful. Friday’s mission will mark the 15th orbital flight for Russia and the fourth Soyuz-FG launch in 2018. The country’s next orbital launch is currently scheduled for December 3, when Soyuz-FG is planned to be employed once again for a mission to ISS, this time sending Expedition 58 crew trio to the orbital laboratory.